After consistent bad performance of cricket team in past two matches against India and West indies all Pakistani cricket fans were disappointed and disheartened, lost hope for even showing up in quarter finals. A group of raged youngsters took out the mock funeral of the team in the Farooqabad locality of Multan city. 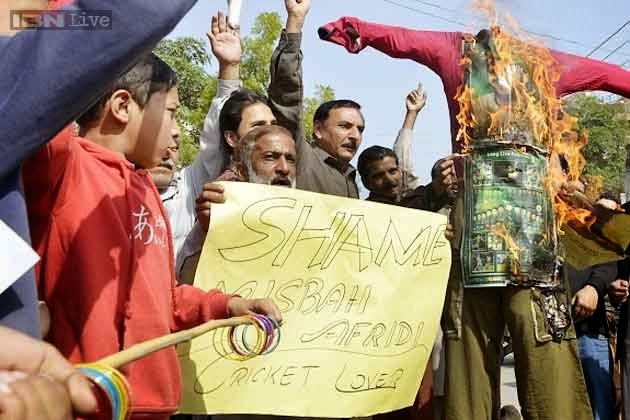 They also set on fire an effigy of the former chairman of the Pakistan Cricket Board; who is on its board of governors presently, Najam Sethi, they found him guilty of bad team selection and performance. Disheartened cricket fans took out the mock funeral on streets; expressing their protest after the national team showed real bad performances in the first two matches of the ongoing World Cup. "We have taken out this mock funeral because millions of cricket fans stayed up all night and prayed for success of the cricket team. But the team let us down so badly," one of the protesters said to local media. "After losing to India, we were expecting the team to bounce back against the West Indies but instead we performed even worse. It appeared as if the players had no pride or will to win, which is shameful," the protester added. During the mock funeral, protesters also carried banners criticizing the players and head coach Waqar Younis. Even senior politicians vented their frustration on social media after Pakistan’s 150-run defeat to the West Indies. Senior politician and Senator Syed Mushahid Hussain said it was time for the "Sifarashi" culture to stop in cricket and let real players come. "Cricket is big in Pakistan and if our team is to be a consistent winner, we have to get rid of favoritism and nepotism in our cricket," he said. Reports coming in from New Zealand of senior players Shahid Afridi, Ahmed Shehzad and Umar Akmal misbehaving with fielding coach and trainer further irritated the fans. Reportedly Grant Luden and Shehzad having an argument with Waqar in the nets over his shot selection. "The players who think they are bigger than the game must be sacked," a small group of protesters in Karachi said while carrying placards and banners.